As part of my continuing personal endeavour to create very readable digital versions of old books, I had placed my attention on books by and about Oscar Wilde. I came across this book, Oscar Wilde and Myself written by Lord Alfred Douglas. I thought of taking up this book for the conversion into a readable digital book. The steps involved copying the text from certain scanned versions of the original book and recreating them as text in MS Word. It had its travails in that text had to be reformatted and the line-by-line (not sentence by sentence) arrangement of the copied text had to be made into connected sentences, from broken lines. I am used to this kind of work, and I do know as to how to go about this. As the work proceeded, invariably I started reading the text with a most cursory interest. I had not expected much in this book other than a lot of claims and refutations that can be expected considering the background to the book. However, suddenly it occurred to me that there is more to this book than might be detected by a native-Englishman. The insights are not what have been provided by Alfred Douglas, but rather what I could pierce out from the text, with my own background as an independent researcher on language codes, and the effect of feudal language codes on pristine-English and pristine-England. This book, quite obviously, had been written on the spur of the moment, in a sporadic mood of extreme hate and vengeance. The book is dated 1914. However, it is seen mentioned unkindly elsewhere that this book had been ‘largely ghost-written by T. W. H. Crosland, the assistant editor of The Academy and later repudiated by Douglas.’ I cannot say anything about this, since I am not a scholar on Oscar Wilde books, writings and life. My scholarship is in the domain of my own realm of thoughts, mentioned above. The book is essentially Alfred Douglas’ version of what really happened. It is good quality writing. From a person who obviously is from a high mental stamina. In this book a commentary can also be found. This commentary is not about the events mentioned in the book. It is rather an attempt to see if the events had been triggered by an insidious attempt by a feudal language mentality to wreak havoc upon a planar language (pristine-English) social set up. Since the author of the commentary is not from either of the language systems therein, the discourse is more or less exploratory. However, the whole of the thought-stream might be quite novel and sort of outlandish for people who have not heard of such a thing as ‘feudal language’. From this perspective, it might be mentioned that this book might contain solid information on what might be going wrong in the vital insides of all native-English nations, as they get constantly bombarded with population groups whose innate language codes are not known or understood. THE manuscript of this book was completed by me and handed over to the publishers as long ago as last July. Certain persons thereupon deemed it advisable to apply to the Court for an injunction restraining me from including in my book any of the letters from Oscar Wilde which were in my possession, and they further applied for an injunction restraining me from quoting from the unpublished portion of the "De Profundis" manuscript which is now sealed up at the British Museum and which was used against me in open Court as part of the justification in the defence to a libel action brought by me, in April 1913. The application for these injunctions was made in the Vacation Court before Mr. Justice Astbury, the most recent recruit to the Judicial Bench. It was immediately granted, and though I was advised by counsel to appeal against the decision, I thought it better to accept it, at any rate for the moment. Consequently, all the copious extracts I was intending to publish from the “De Profundis," which extracts had already been reproduced in all the newspapers at the hearing of the action of Douglas v. Ransome and The Times Book Club have been entirely removed. The same applies to those letters of Wilde's which I had originally included in my book. As far as the letters are concerned, the omission does not very much affect the book. The letters were included not to make points against my opponents, but merely as interesting curiosities. The enforced omission of the extracts from the unpublished “De Profundis" has, on the other hand, been an undoubted handicap to me. 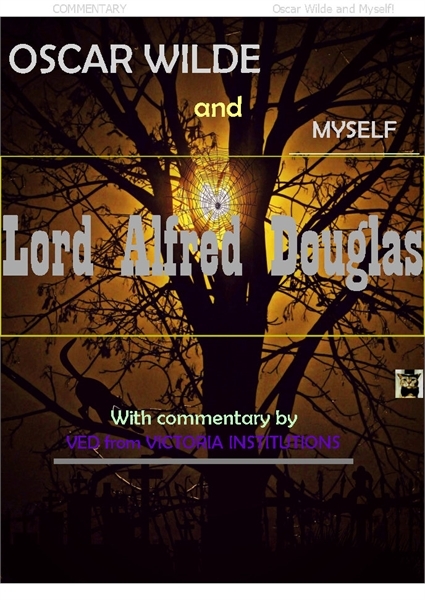 A considerable portion of this book is devoted to a reply to the violently mendacious attacks made upon me and upon my family by Wilde in that unpublished portion of the “De Profundis” which has been accepted by the authorities of the British Museum from the literary executor of the late author. Obviously it is very difficult to reply to an attack which one is unable to quote, and I can only say that I have met the difficulty as best I could, and that at a future date I look forward to being able to deal with the whole matter even more completely and finally. In this connection I refer my readers to the chapter in this book entitled "A Challenge to Mr. Ross."